Three-time Tony nominee Condola Rashad stars in the title role of Saint Joan at the Samuel J. Friedman Theatre. Her performance all but guarantees a fourth, and I expect her to win this time. She is, simply, a brilliant actor. In addition to her talents, the Manhattan Theatre Club has assembled a cast with chemistry and expert craftsmanship under the direction of Daniel Sullivan. When the weak link is George Bernard Shaw’s rather long script, you have the makings of theatre at its best. The story is set in 15th century France during the Hundred Years’ War, and the English are winning. Along comes a peasant girl (Joan of Arc) who hears the voices of saints and angels to inspire the French forces. They retake Paris, crown Charles VII king, and all is well. At least, all is well until Joan is captured, turned over to the English and burnt at the stake for heresy. Rashad plays Joan in a way distinct from the image of her that historians, French patriots and various other artists have created. Hearing the voices of saints and angels used to confer a certain holiness to a person. Post-Freud, we tend to believe schizophrenia is more likely than divine intervention. So, there is a bit of madness in Rashad’s portrayal – not round-the-bend crazy but there is something not quite right with Joan. In addition, Joan was an illiterate peasant who had seen almost nothing of the world before she took up arms. So in addition to the madness, there is a child-like naivete about Rashad’s Joan that hits the mark. The cast supporting her is exceedingly well chosen. The hard-core churchmen (and eventual bad guys) are excellent – Walter Bobbie as Cauchon, the Bishop of Beauvais, and John Glover, the Archbishop of Rheims. And for such a serious subject, a certain comic relief is a welcome necessity. Adam Chandler-Berat as the Dauphin (crown prince) who doesn’t really want to become Charles VII is meek and witty. And I confess to really enjoying Jack Davenport as the Earl of Warwick – he plays a type of English nobleman who is a bit lazy intellectually but cunning and frightfully polite. He doesn’t quite say “Dreadfully sorry about the whole burning at the stake thing, but it was necessary.” Yet every action does say it. Hats off to Jane Greenwood’s costumes, Tom Watson’s hair and wigs, and above all, Scott Pask’s inspired scenic design. The set reminds one of a cathedral pipe organ, giving the whole thing a medieval feel and offering Christopher Ash’s projections a most interesting screen. My one complaint goes back to Shaw. The epilogue takes place in the bedchamber of Charles VII 25 years after Joan is burnt, and several of the characters appear and make peace amongst themselves. In this production, it’s done with a playful approach that makes it more enjoyable than it reads. Still, the script does get lost on its way to the end. 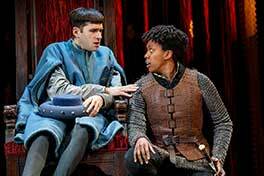 Adam Chandler-Berat as the Dauphin and Condola Rashad at Saint Joan, Photo by Joan Marcus.